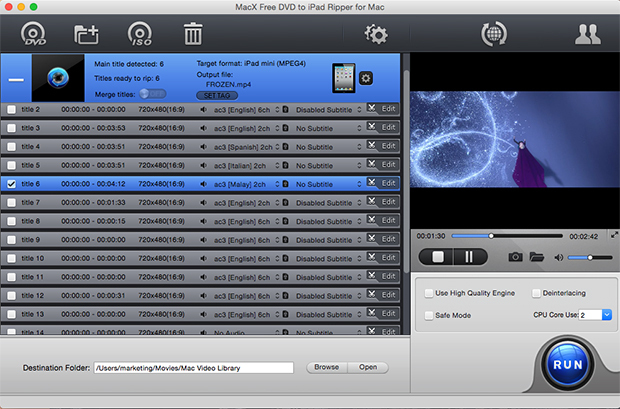 MacX Free DVD to iPad Ripper is a powerful yet free Mac DVD to iPad ripper software which supports ripping both homemade and protected DVD films to iPad in MP4, H.264, MPEG-4 format for free on Mac. Besides ripping DVD to iPad, it also can exacting audio out of DVD to be saved as MP3 music. This free Mac DVD ripper for iPad offers robust functions for you to edit the video, trim video from DVD, adjust parameters and more. 1. Free rip home-made and encrypted DVD to MP4, H.264, MPEG4 that is fully compatible with all types of iPad on Mac. 3. Armed with editing features, this Mac free DVD to iPad ripper allows users to edit video by cropping, trimming, merging, adding external subtitle to video. 4. This free Mac DVD to iPad ripper can let users extract audio from DVD as ringtone and take snapshot you favor. 6. The multi-core CPU usage and hyper threading technology extremely fasten the DVD ripping speed. 7. Fully support High Quality Engine and Deinterlacing feature, delivering remarkable output video quality. 8. With the innovative easy-to-use interface, this free DVD to iPad ripper provides both novices and professionals with easier and more pleasant DVD conversion experience.